Jewelry has always been something I've loved. I used to spend hours digging through my grandmothers' jewelry boxes (which both got handed down to me upon their passing) and it still is something I can't leave the house without having some form of it on. Recently I've been more interested in investing in nicer pieces, that won't turn my skin green and I could own for the rest of my life. My birthday watch was the first step. I would love to own a few pairs of earrings, as in the past couple of years all my cheap ones hurt my ears by the end of the day :( Rings are also on the wishlist for some point in my life, and Bario Neal in Center City is perfect eye-candy. The sustainable jewelry store does custom work with reclaimed metals and ethically sourced stones. 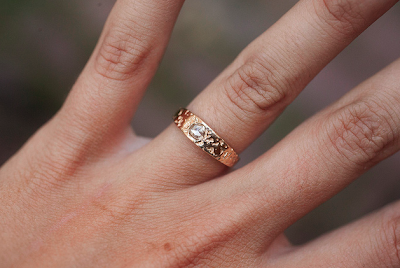 Amanda got her engagement ring from there, and it's truly one-of-a-kind!